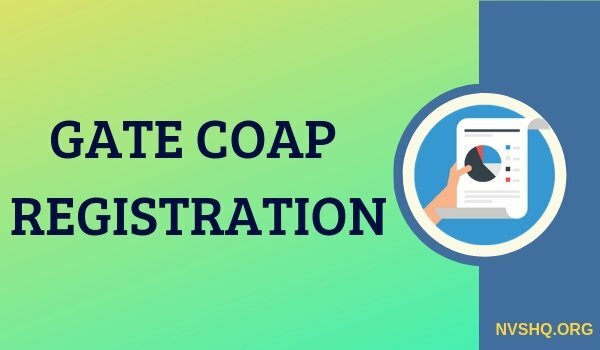 COAP Application Form 2019: COAP 2019 registration process will start in the month of April and is expected to begin from 2nd April 2019. GATE 2019 has been completed and admission process will be started under COAP after the declaration of GATE 2019 result. After the activation of COAP 2019 portal, candidates having a valid GATE scorecard will be able to register under COAP in order to accept the offers made by the participating organizations. Candidates waiting for COAP registration 2019 can scroll down to get complete information about COAP 2019. Here they get information about COAP, all the participating institutes, eligibility criteria, registration process, and some FAQs. Candidates must be of Indian nationality. Candidates must have qualified GATE 2019 or 2018 or 2017 and have valid scorecard. Apart from fulfilling the COAP eligibility criteria, applicants are also required to satisfy the eligibility requirements of the IITs for they have applied. Candidates graduated or graduating from IITs having a valid GATE score is applicable. Candidates graduated or graduating in B.Tech. degree from IITs and having CGPA of 8.0 or above are not required to register on COAP. Such candidates can directly apply to the respective institute for admission to M.Tech. As COAP is an online admission platform, GATE candidates have to register only through the online mode. Hence, no other mode of application will be available. The registration procedure will begin from 2nd April 2019. Candidates must read all the guideline and instructions regarding the admission and registration process. They have to fill all the genuine and accurate details in the registration form. Once applicants have submitted the registration form no request for change will be accepted. Applicants have to visit the official COAP 2019 portal. They have to click on the “Register Now”. Step II- After initial registration, candidates have to read the procedure and instructions provided. Step IV- Now they have to enter all the details such as Name, GATE Registration number, GATE score, Date of birth, Email ID, and Mobile number. Step V- Candidates have to click on “Submit” button to submit registration. After submitting registration, candidates will receive the log in information through SMS and email. Email will contain the website URL and login details whereas SMS will contain the password details. Step VII- Candidates have to log in using the URL and other details and have to verify the registration details. Step VIII- They can enter the additional GATE score (if any). Step IX- They have to submit the registration. Step XI- Once they have registered, they can access information about the job offers made by PSUs and other offers made by the participating IITs. Offers will be tagged with COAP registration no. No registration fee is applicable for any candidate applying for COAP. Any information regarding the same will be updates here. After successful registration, GATE candidates have to check the offers make by the institute and candidates have to choose their preferred offer and continue further. It will be conducted in various rounds. Candidates found without any of the aforementioned documents will not be provided admission and his/her candidature will be canceled. Common Offer Acceptance Portal (COAP) is basically an online portal that provides a platform to all the candidates seeking admission to M. Tech program to choose the most preferred admission offer from various participating institutes. COAP 2019 will be a responsibility of IIT Madras. COAP is a portal where all the participating institutes and organizations upload their offers and registered candidates have to choose among these offers. Candidates must keep in mind that it is not an admission portal and therefore, candidates should apply separately to their preferred institute. They just have to use COAP for accessing the offers and making decisions on most preferred choice. Ques.- Is it necessary for candidates to register at COAP? Ans.- Yes, it is compulsory for the candidates seeking admission to M.Tech programs to register at COAP. Without registration, they will not be able to receive and access admission offers made by the participating institutes. Ques.- What are the prerequisites for COAP registration? Ans.- Candidates must have a valid GATE score card, email ID and a mobile no. Ques.- Is it necessary to send hard copies of any reporting documents? Ans.- No, there is no need to send hard copy any of the document. Ques.- How many offers a candidate can make in each round? Ans.- Candidates can select maximum one offer among all the offers available in each round. Candidates cannot select multiple offers at a time. Ques.- Can a Foreign National with valid GATE scorecard register at COAP? Ans.- No, foreign national candidates are not required to register at COAP. Ques.- Can a candidate under the Quality Improvement Program (QIP) register at COAP? Ques.- Can a sponsored candidate register at COAP? Ques.- Can a defence sponsored candidate register at COAP? Ques.- How candidates will know about the status of any job/ offer? Ans.- Candidates can check the job/offer status by logging in COAP by using the ID and password during the scheduled dates. Ques.- Whether the admission/job offer will be made available at the official website of the respective institute of organization? Ans.- No, admissions and job offers will be made available only on the COAP official website and it can be accessed only by the registered candidates. Ques.- What are the steps that candidates have to follow after accepting an offer? Ans.- They have to visit the official website of the concerned institute/organization and have to complete the admission formalities within the stipulated dates. Ques.- Will all the participating organization and institutes have same no. of admission rounds? Ans.- No, not necessarily as it totally depends upon the selection process of the institutes. Candidates can refer the official website of concerned institutes. I am requesting you sir, I got 307 score and 24.43 marks, ST category(boy) which IIT I have choice to get in EE,GTE,WRE,TE or any other courses. Sir, I have got 53/100 marks, Gate Score 611, All India Rank- 1990, I am Female(OBC-NCL) se hu. Sir suggest to me this GATE Score par mujh kaya mil saktya hai. Mai Computer Science se B-Tech pass out hu. Kindly suggest to me I want M-tech in Computer Science in reputed IITs, NISs & IIIts. i got 44 marks,rank 1181score 169 branch MT(2019) Category:SC . which IIT clg will i get. i got 44 marks,score 169 and rank 1181 branch MT(2019) Category:SC . which IIT clg will i get. i got 44 marks,score 169 and rank 1181 branch MT(2019). which IIT clg will i get. Sir I have registered on coap but didn’t received password in my mobile number.How to login now? ?